10-year old Nanoha Takamachi finds a magical mascot character (Yuno in ferret form) and agrees to help him on his quest to collect numerous dangerous artifacts known as the Jewel Seeds. Nanoha starts off like any typical magical girl, but she quickly shows signs of being a combat genius, improvising and improving on what she's taught - starting with eradicating that lengthy incantation to get battle ready and showing she has a talent for long-range magic. Like other magical girls, Nanoha is a caring magic user - a warm heart that desires to help and save people. Very unlike most other magical girls, who go by "Peace through Love", Nanoha goes by the philosophy of "Peace through Superior Firepower". Fate Testarossa, her rival in collecting Jewel Seeds, was befriended by earnest words which slowly touched her heart... and by blasting her with an unhealthily impossible magnitude of magical destruction. This hardly means Nanoha is a trigger happy monster; merely, she tries to talk first, and if words fail, she puts her feelings in her (non-lethal, no matter what the collateral damage looks like) firepower - i.e. the martial artist's way of communicating. Nanoha is strong-willed and hard-working, but she is also a sweet girl who is easy to get along with provided you aren't doing something highly disagreeable to her sense of morals. Normally such an attitude is associated with evil villains. Even when called a devil by an opponent trying to hold back tears, Nanoha does not back down. "Call me a devil if you want. If that's what it takes, I will use my hellish power to make you listen to my words." 10 years after Season 1: Nanoha still gets along very well with Fate (see: giant double-bed in their room), is still oblivious of any romance with Yuno and has not lost her "Peace through Superior Firepower derived from pushing yourself hard" approach to saving those dear to her. Her friends and family have been briefed on her magic and she has moved to the capital city of mage society, working as an Ace Trainer. She loves her job to the point of refusing promotions to stay on the front line, bringing Training From Hell to more cadets. Instead of finding romantic love, she finds maternal love. She's sweet, yet she's strong-willed and hard working. Enough qualities to ensure a future Saimoé career. As a rookie in Saimoé Japan 2005, Nanoha was explosive from the get-go, and by breezing through the first handful of rounds, she easily made her way to the final four. However, a destined meeting with Shinku (Rozen Maiden), the very opponent who defeated her friend Fate in the first round by only 18 points, turned to be the beginning of the passionate Nanoha-Rozen Maiden rivalry. A win by 116 led to a final matchup against Shinku's older sister Souseiseki (Rozen Maiden), and a 125 point victory gave Nanoha Takamachi her own Saimoé tiara. As her friendship with Fate developed overtime, so did the reigns, so to speak. 2006 turned out to be a down year for Nanoha, as her debut in Korea's first tournament was short lived. Japan was to be much more promising, as she literally outlasted the competition, finding her struggle in the round of 32 with Aika Granzchesta (ARIA) despite winning by a margin of 100 plus. However, she met Fate in the round of 16. Despite not holding back against her best friend, she lost by around 300, and she therefore left Fate to go on the experience of her life. Although the experience was one to be thankful for, Fate did indeed lose to Suiseiseki (Rozen Maiden) in a mirror match of last year. 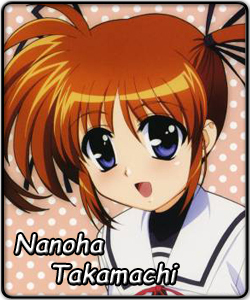 Nanoha returned in 2007 in order to prove that her championship was no fluke. However, her luck in Korea was short lived. Despite dominating the preliminaries, Nanoha met Shana (Shakugan no Shana) in the round of 32, and in a match filled with major controversy, Nanoha lost 1009-1010, officially finishing in 17th Place. In Japan, Nanoha had a little trouble from the start, edging Yutaka Kobayakawa (Lucky Star) by only eight, in the first round, then barely scraping Runa Edomae (Seto no Hanayome) by 44 in the round of 32. After edging out Vita, one of Nanoha's interseries rivals, in the round of 16, Nanoha then lost to Rena by only 38 in the round of 8, officially finishing in 6th place. It should also be noted that in the invitational Korea Super Best Moe Tournament, Nanoha was edged out in the preliminary round by Haruhi Suzumiya (Suzumiya Haruhi no Yuuutsu) and Maria (Hayate no Gotoku), losing to the latter by only 9 votes. The 2005 Saimoé Japan champion enters the International Saimoé League ready to prove that she still has the fire power to continue in these competitions, and with her accepted entry to Saimoé Japan 2008, she is ready to prove that she still has what it takes to win her second Saimoé tiara.